Ever wondered what happens at the Aquarium after dark? Find out on this special adventure! Time: Fridays at 7 p.m. to Saturdays at 8 a.m. Cost: $30 per person. Children under 18 must be accompanied by an adult. Pre-registration required. No refunds for Aquarium Overnight ticket purchases. Questions: Please see our FAQs. Contact: Call (505) 848-7180 or email [email protected]. 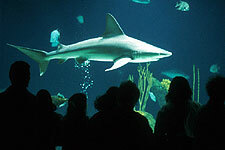 Sleep next to the sharks at the ABQ BioPark Aquarium! How do fish sleep? Find out at the November Aquarium Overnight.